Why did thousands of people refuse to evacuate before Hurricane Matthew? As Hurricane Matthew approached the Atlantic coast earlier this month, more than 2.5 million people were told to evacuate in Florida, Georgia, South Carolina and North Carolina. Further orders were issued last week in eastern North Carolina, where devastating floods have killed 26 people. Many residents followed these orders, but others stayed in place. In South Carolina, for example, estimates indicate that about 35 percent of residents under evacuation orders actually left their homes. In highly threatened coastal areas around Charleston and Beaufort, the rate was about 50 percent. Florida Gov. Rick Scott held multiple briefings urging people to leave storm zones. “Do not surf. Do not go to the beach. This [storm] will kill you,” Scott warned. Hurricane Matthew illustrates the challenges of managing disaster evacuations effectively. Multiple factors influence decisions about evacuating, including residents’ genders, how long they have lived in their homes and their feelings of responsibility for friends and family members who decide not to move. Often people who remain are poor and highly vulnerable. I study how communities prepare for, respond to and recover from disasters, including hurricanes and wildfires. As a public health researcher, I focus on potential health impacts and look for ways to use data to make communities and individuals more resilient against future disasters. By understanding who is likely to obey or ignore evacuation orders, authorities can use data to reduce the number of false alarms and concentrate limited resources on groups who are most likely to choose to shelter in place. There is always a potential trade-off between mitigating risk and false alarms, but improved forecasting and better pre-disaster planning can dramatically reduce potential financial and opportunity costs of evacuating. Research shows that several factors strongly influence the decision to evacuate. One of the most important is previous disaster experience. Matthew was the first major hurricane to make landfall on the Atlantic coast of Florida since Wilma in 2005, so it probably was the first such experience for many people who moved there over the following decade. People’s expectations and perceptions of risk also strongly influence their willingness to leave storm zones. Authorities issuing evacuation orders count on residents to remember positive experiences with evacuation or negative experiences from not evacuating. The problem is that many people have short memories — even in highly vulnerable areas. In Charleston, hurricane evacuation experience during Hurricane Hugo in 1988 strongly predicted evacuation decisions four years later during Hurricane Emily. However, when Hurricane Fran made landfall some 170 miles to the north eight years later, many residents had adjusted their risk perceptions and decided not to evacuate. After all, there hadn’t been a bad hurricane in nearly 10 years. 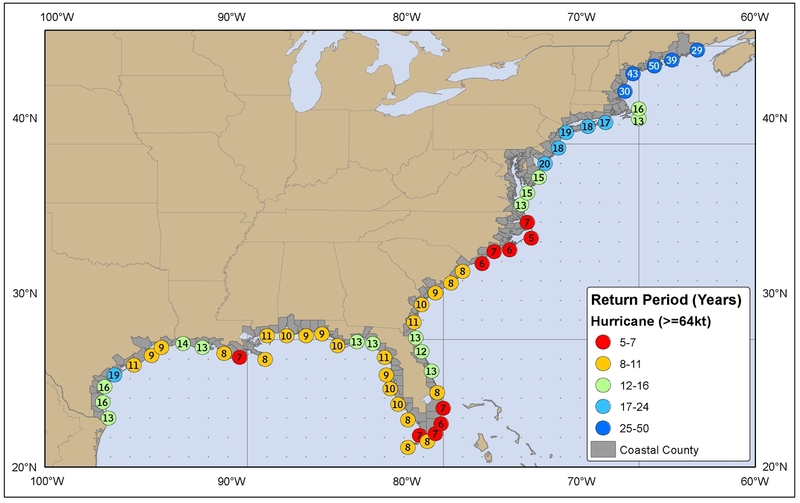 Estimated return period in years for hurricanes passing within 50 nautical miles of various locations on the U.S. coast (click for larger image). A similar pattern occurred during Hurricane Katrina in 2005. After hundreds of thousands of Louisiana and Mississippi residents evacuated ahead of Hurricane Ivan in 2004, the storm weakened from Category 5 to Category 3 and moved east, making landfall in Baldwin, Ala., and causing minimal damage in Louisiana and Mississippi. As a result, many residents questioned the need to evacuate a year later as Katrina approached. Cost is typically a weaker predictor of behavior. Generally, up to 75 percent of evacuees can stay with friends or family. But for those who cannot, the costs of fuel, hotel rooms and lost wages can significantly impact family budgets. One recent study calculated that evacuating before a Category 3 hurricane would cost a household approximately $340 to $525. Timing matters too: Weekend evacuations can cost less, particularly for those without paid sick leave or vacation time. While these costs may seem modest compared to the risks of staying in place, households that cannot afford to evacuate are also vulnerable in other ways. They are more likely to be located in flood plains or to live in mobile homes, and to lack reliable family transportation. This is particularly true in the southeastern United States. Between 2000 and 2012 populations in the southeastern Atlantic and Gulf Coast census regions increased nearly twice as fast as the national average. Along with this growth, the proportion of coastal residents who are socially vulnerable — for example, who are elderly, work in low-wage service industry jobs or belong to racial and ethnic minorities — also rose. In eastern North Carolina, a high-poverty region, many residents displaced by post-Matthew flooding cannot afford to replace damaged goods or repair their homes. But it’s not all about money. Residents who have personal transportation and the financial means to evacuate do not always go. Having a strong social support network tends to correlate positively with good health: For example, if you have a larger and stronger social network you have a lower risk of age-adjusted mortality. But in disasters those social support networks may actually represent responsibilities that prevent people from moving out of harm’s way. This dynamic was clear in New Orleans during Hurricane Katrina. While many residents were criticized for failing to evacuate, they made this decision based on shared norms, local culture and traditions, responsibilities to social networks and a collective history that led them to trust their social networks rather than following instructions from authorities. While the evacuation of New Orleans for Katrina was widely viewed as a debacle, it actually succeeded on many counts. According to the National Academy of Engineering, more people were able to leave the city in a shorter time than was even thought possible. However, many who couldn’t move were triply vulnerable: They had low incomes or lacked transportation, lived in older homes in flood-prone neighborhoods, and had little access to or influence on the development or implementation of local disaster plans and policies. We need to do more work to translate bad experiences like this into policies that can protect residents’ health and safety, while also respecting inherent community strengths that sometimes lead to evacuation failures. It remains to be seen how well evacuations ahead of Hurricane Matthew succeeded. Available information indicates that 35 to 50 percent of people affected by mandatory evacuation orders throughout the storm zone complied. These rates are comparable to prior evacuations. And as in past storms, some coastal residents moved away from storm zones only to be trapped there by inland flooding. As of Oct. 16, 44 deaths had been attributed to Hurricane Matthew in the United States. They include residents who drowned after driving onto flooded roads; crush injuries and trauma from trees falling on homes and cars; and inappropriate use of generators. There will be more deaths and injuries as residents return home to clean up and are exposed to fallen power lines, mold and other stresses that exacerbate existing chronic health conditions. It will take longer to calculate how many deaths and injuries could have been avoided if more people had followed evacuation orders, and to repair storm damage. Rebuilding, and making hard choices about where not to build again, will challenge residents and policymakers. But it is critical to grapple with these issues so we can do a better job responding to the next storm, which likely won’t be 10 years away. Jennifer Horney is an associate professor of epidemiology and biostatictics at Texas A&M University.